The partners of SIMPL are working together to bring you more information on health and safety topics that are relevant to you. Over the coming months the SIMPL partners will “focus on” an issue that is relevant to you and your business and give you practical information and tools on how to manage this topic in your workplace. To help you keep up to date with HSE’s Helping Great Britain Work Well Strategy (HGBWW) and HSE’s Go Home Healthy Campaign you can also subscribe to the HSE plastics and rubber eBulletin through the “subscribe” link on the left hand side of this page. As topical information is published you will receive an email direct to your inbox. 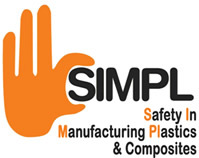 Through analysis of injury data the SIMPL partners have identified that slips and trips remains a big issue for all sectors of the plastics and composites industries. To help manage this issue and try and reduce the number of accidents that happen each year the British Plastics Federation have shared their slips and trips information sheet with industry to help target the causes of slips and trips in the workplace. Find out more about industry advice on managing the risks of slips and trips. The SIMPL partners recognise that health and safety and successful business or organisational performance are complementary. Where there is good health and safety management systems, along with strong leadership, the number of accidents and incidents in the plastics industry could be reduced. In businesses where managers work together with their workforce to establish strong health and safety management systems along with involving employees in day-to-day activities then both business and health and safety benefits can be realised. Strong health and safety management systems doesn’t necessarily mean employing lots of people in different “health and safety roles”. Small companies with 2 or 3 employees can have strong health and safety management systems through good communication, working together as a team and staff being involved on a daily basis with matters that affect their workplace. The SIMPL partners are committed to trying to help industry improve their health and safety management systems and worker involvement and have committed to addressing these two in their strategy.